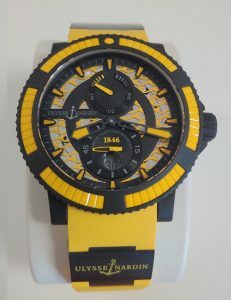 45.8mm, high tech rubber coated case, 42 hour power reserve indicator, and date function, with exhibition glass back. The bezel is set with yellow ceramic inserts. It is available on sporty yellow rubber strap with black ceramic elements and a black ceramic folding buckle.